On April 26, 1937, German and Italian planes, at the behest of the Spanish Nationalist forces attacked the town of Guernica in Northern Spain. Without warning, the planes swooped down on the village, subjecting the citizens to three hours of continuous bombing. The village was left in flames; those who survived the bombs and tried to escape to surrounding fields were shot down by machine-gun fire from the air. Guernica is the painting by Pablo Picasso, inspired by the bombing. It is one of the most important paintings in history. 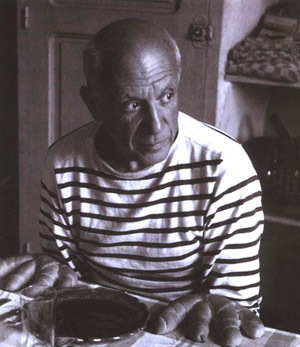 Food was a frequent subject for Picasso. Below is an indepth analysis of another Picasso painting, Still Life with Blood Sausage. This entry was posted in Mission Status and tagged Art History Service. Bookmark the permalink.